This is the last post in the series of basics of HRCT. links to the previous posts are given at the end of this post. 1. Lymphangitic carcinomatosis: irregular septal thickening, usually focal or unilateral 50% adenopathy', known carcinoma. 4. Lymphangitic carcinomatosis with hilar adenopathy. 5. 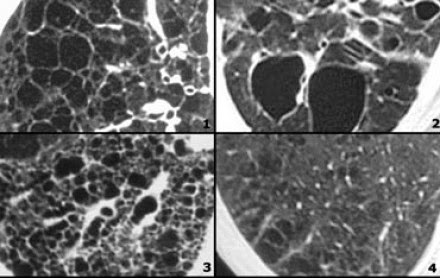 Alveolar proteinosis: ground glass attenuation with septal thickening (crazy paving). 1. 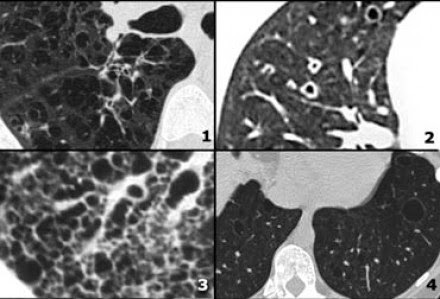 Hypersensitivity pneumonitis: ill defined centrilobular nodules. 3. Sarcoidosis: nodules with perilymphatic distribution, along fissures, adenopathy. 4. 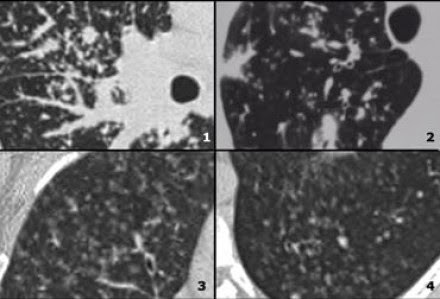 Hypersensitivity pneumonitis: centrilobular nodules, notice sparing of the area next to pleura and fissure. 1. Sarcoidosis: nodules with perilymphatic distribution, along fissures, adenopathy. 2. TB: Tree-in-bud appearance in a patient with active TB. 3. Langerhans cell histiocytosis: early nodular stage before the typical cysts appear. 4. Respiratory bronchiolitis in infection. 1. 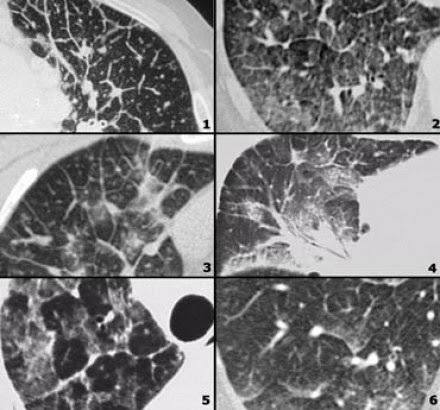 Chronic eosinophilic pneumonia with peripheral areas of ground glass opacity. 2. Sarcoid end-stage with massive fibrosis in upper lobes presenting as areas of consolidation. Notice lymphadenopathy. 3. Chronic eosinophilic pneumonia with peripheral areas of consolidation. 1. Non specific interstitial pneumonitis (NSIP): ground glass with traction bronchiectasis, no honeycombing. 2. 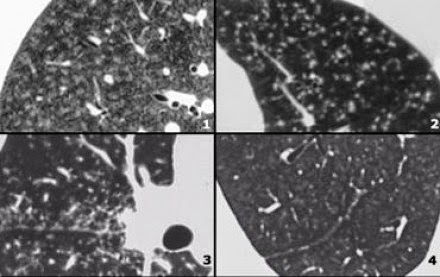 Cryptogenic organizing pneumonia (COP). 3. Sarcoidosis end-stage: consolidation as a result of massive fibrosis perihilar and in upper lobes. 1. Lymphangiomyomatosis (LAM): uniform cysts in woman of child-bearing age; no history of smoking; adenopathy and pleural effusion; sometimes pneumothorax. 2. LCH: multiple round and bizarre shaped cysts; smoking history. 4. 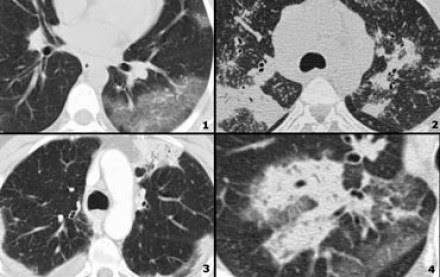 Centrilobular emphysema: low attenuation areas without walls. 1. 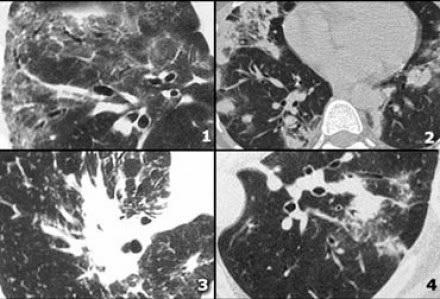 Centrilobular emphysema: low attenuation areas without walls. Notice the centrilobular artery in the center. 2. Langerhans cell histiocytosis (LCH): multiple thick walled cysts; smoking history. 4. Lymphangiomyomatosis (LAM): regular cysts in woman of child-bearing age.